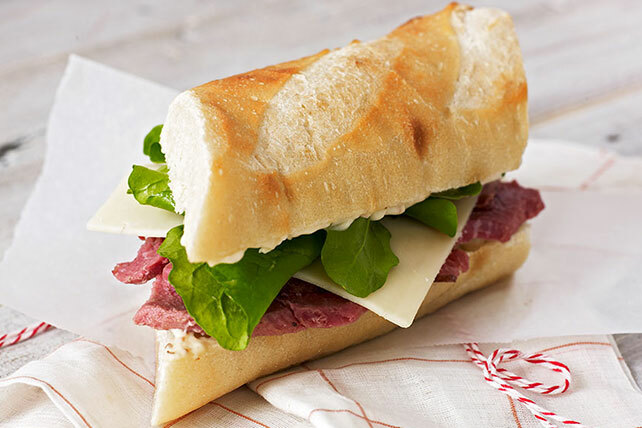 This bistro-style sub sandwich is truly a cinch to make. We made a how-to video for it anyway—and enjoyed eating the results! Spread cut sides of baguette with mayonnaise. Serve this flavorful sandwich with a fresh fruit salad. Cook and stir 1/2 cup sliced onions in 1 tsp. margarine in large skillet on medium heat until lightly browned. Stir in 1/4 tsp. sugar. Makes 1/4 cup. Often mistaken for a type of lettuce, arugula is a leafy herb, with a wonderful peppery flavor, that is part of the mustard green family. Look for it in the produce section of most larger supermarkets.